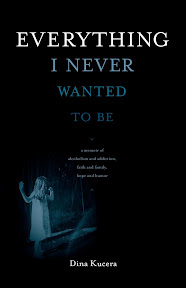 Everything I Never Wanted to Be [Book Review] – my books. my life. It’s always a little strange to review a memoir. I mean, I don’t really want to review this woman’s life. It’s her life. And it hasn’t been an easy one. But it certainly made a wonderful book. Everything I Never Wanted to Be was heartbreaking and hilarious. I would laugh out loud at one paragraph and shed a tear at the next. Dina Kucera is a standup comic and grocery checker. She is also a recovering alcoholic. Her husband is unemployed, her mother has Parkinson’s, her grandson has cerebral palsy. Her three daughters have a plethora of mental illnesses and addictions between them. She spends her days getting rid of imaginary people under her mother’s bed, checking her daughter into rehab (again), and smiling at customers who bring 67 items into the express lane. This is her life. Every day. Kucera relates her often-painful history in such a brutally honest way. Instead of despair, this book offers hope. It is full of humor and love and faith. I wanted to quote passages, but they are all so wonderful I can’t choose. I really hope you pick up this book. You won’t be able to put it down once you do. Thursday, December 2nd: my books. my life. Buy It Now: Get 30% off Dina’s book at www.everythinginever.com by entering coupon code “Dina” at checkout.